The Pawtucket Red Sox are pleased to announce that OF Bryce Brentz has been added to the International League All-Star Team for the 2017 Triple-A All-Star Game that will be played on Wednesday, July 12 at 9:00 pm ET at Cheney Stadium in Tacoma, Washington. Bryce has also been chosen to participate in the Triple-A Home Run Derby that will be staged at Cheney Stadium on Monday, July 10 at 10:05 pm ET. Former PawSox slugger Chris Marrero won the 2016 Triple-A Home Run Derby last July in Charlotte, NC. Brentz will join PawSox teammates OF Rusney Castillo and LHP Edgar Olmos who were both selected to the team last week. Bryce has been among the hottest hitters in all of professional baseball since late-May. Since May 23 he is hitting .375 (51-for-1136) with 14 HR & 40 RBI. Only two players in baseball have more homers over that span (Cody Bellinger of the Dodgers and George Spring of the Astros each with 15 HR) while Brentz ranks 1st in all MLB and MiLB in RBI (40), OPS (1.241), and SLG (.779) since May 23. He had a superb June batting .340 with 11 HR & 27 RBI in 27 games. Overall on the season, Bryce is batting .282 and is tied for 2nd in the league with 18 HR (one behind leader Rhys Hoskins of Lehigh Valley). He is also 6th in the IL with 49 RBI and 2nd in the league in slugging pct. (.564). His 1 HR per 13.39 AB is the best ratio in the IL. The 28-year-old Tennessee native was a sandwich pick between the 1st & 2nd round of the 2010 draft by Boston (#36 overall) out of Middle Tennessee State University where he led the NCAA in average (.465), HR (28), and SLG (.930) in 2009 as a sophomore. 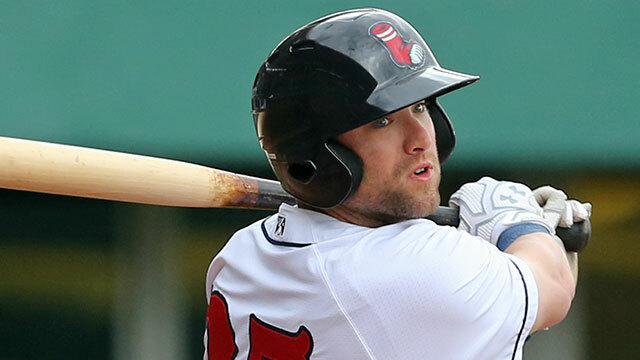 Brentz has played for Pawtucket since late in the 2012 season and has belted 59 HR in 330 career games with the PawSox. He has also appeared in 34 games with the Boston Red Sox (2014 & 2016) and has a career Major League average of .287 with 1 HR & 9 RBI. The 2017 Triple-A Game marks the 20th straight year that All-Star teams from the International League and the Pacific Coast League will face each other (the International League leads the series by a 12-7 margin since the game changed to the current IL vs. PCL format). The game will be played the night after the Major League All-Star Game and will be televised live on MLB Network, American Forces Network, MiLB.TV, and broadcast on the Triple-A All-Star Game Radio Network which includes the PawSox Radio Network (920 AM WHJJ the flagship). PawSox radio broadcaster Josh Maurer will be one of two handling play-by-play on the radio.